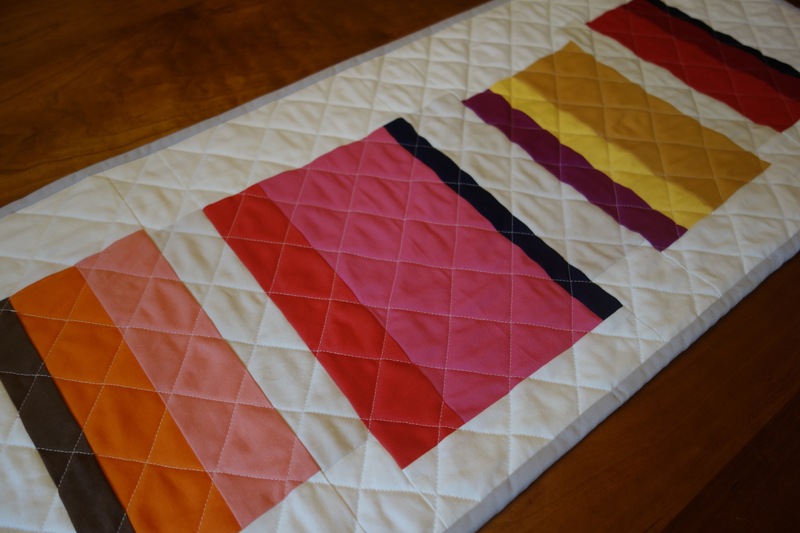 I made this table runner for Ellison Lane’s Modern Mini Quilt Challenge. A first for me! I love how open this challenge is–entries just have to be not too big or not too small. I was excited to try out a palette and style that I am thinking of for a baby quilt. I threw in some neutrals between the brights so the design wouldn’t be overwhelming. For the binding, I wanted something other than the white (Kona Bone), but I didn’t want to create a strong frame–so I opted for Kona Ash, which is a nice soft gray. The cool gray offsets the warm colors in the design, which I think strikes a nice balance. The table runner is in my Etsy shop! Check out the other entries in the challenge–there is some really lovely work. I especially like the entries from Joanna at Shape Moth, Laura from x.o, and Kim and Windsor and Main. Next up for me is a striped play mat with wool batting that I am really looking forward to getting started. I am linking up with Jennifer’s Modern Mini Challenge! This entry was posted in quilts, small projects and tagged ellison lane, modern mini, modern mini quilt challenge, Placemat, Quilt, quilt challenge, Shape Moth, table runner on June 15, 2013 by brigitdermott. 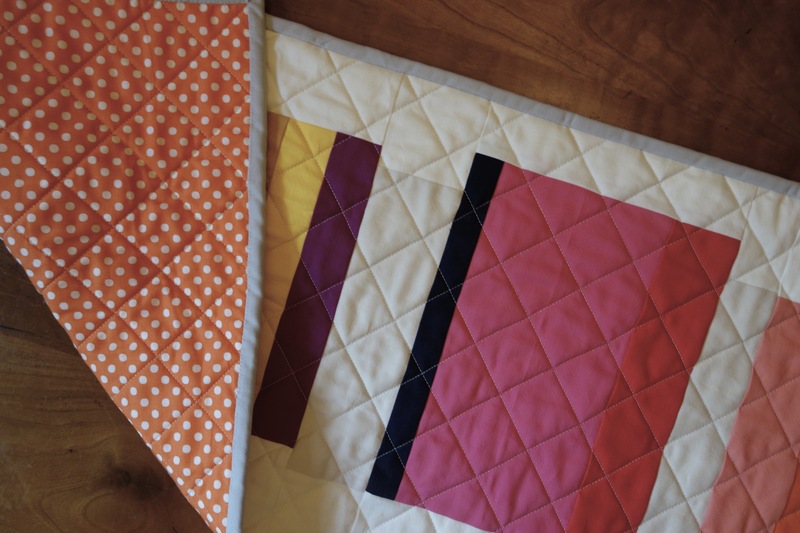 Very pretty solids and I love the backing orange dots. Thanks for entering the Modern Mini Challenge! Thanks for hosting the challenge! It was great to participate and see all the other great work!